← The lines are drawn – Stop market gentrification of the DTES! The world’s “Greenest City” is home to some very dirty business. Weren’t invited to the BC Mining Week Opening Gala?? 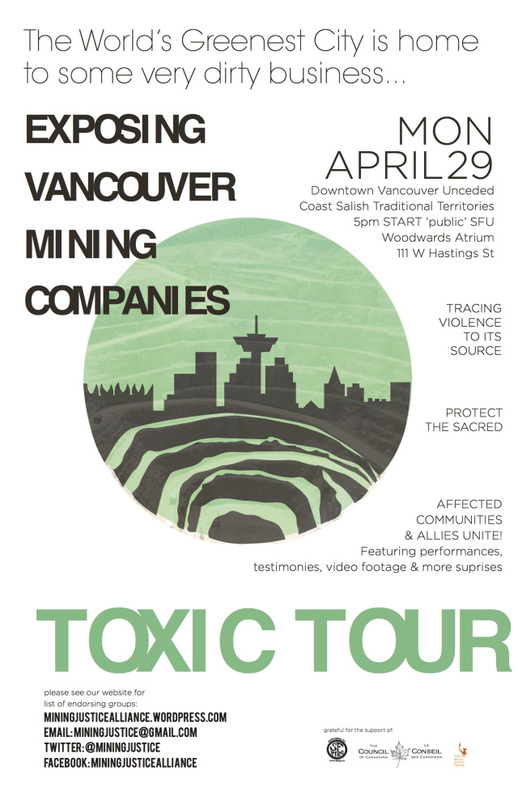 Join us for a “Toxic Tour” of Vancouver’s mining headquarters!! Featuring performances, testimonies, video footage and action-packed surprises. BC Mining Week’s Opening Gala Event at Canada Place …and outside: THE OTHER GALA to honour community resistance to unjust mining and expose the violence of Vancouver companies. Food, Video, Speakers, and more. Stand in solidarity with communities affected by Vancouver mining companies throughout Turtle Island and across the globe! Visit the corporate headquarters of mining companies and hear from communities resisting mines! Reject government-supported corporate violation of peoples’ lands, waters, rights and livelihoods! Honour those who have been injured or killed for their opposition to Canadian mining projects! Bring your children, parents, grandparents! 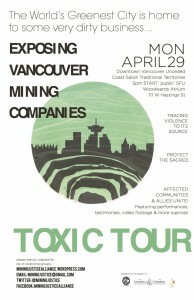 Endorse: The Mining Justice Alliance is inviting groups to endorse the Toxic Tour. Please let us know if we can add your group to our public endorsers list. The City of Vancouver plans to become the “greenest city in the world.” It is also home to the world’s largest conglomeration of mining companies. Beginning on April 29th 2013,Vancouver will host BC Mining Week. After an opening gala, where the “Mining Person of the Year Award 2012” will be granted, BC’s mining industry leaders will spend a week wining and dining at receptions, awards ceremonies and charitable events. On their websites and in press releases, extractive corporations claim to bring economic and social ‘development’ to local and indigenous communities in BC and across the world. But the “greenwashing” can’t hide the increasing reports of conflict, environmental devastation, water toxicity and scarcity, human and indigenous rights violations, and violent repression–even murder–of residents who speak out in opposition to extractive projects. Ever wondered why so many mining companies set up shop in Vancouver? The Canadian government actively assists extractive corporations with taxbreaks, subsidies, lax stock market regulations, diplomatic support, and immunity from prosecution for environmental destruction and human rights abuses overseas.